The Magellan LD Boxmaker is a new concept in short-run Boxmaking design. It is new from the ground up. The Magellan LD Boxmaker was conceived to address the short-run large format box industry, but to do so at not only an affordable price but at a higher production speed than most other boxmakers of comparable size. The Magellan LD is a center-set machine, meaning all set-tings are made from the center of the machine, much like that of a press or a die cutter. 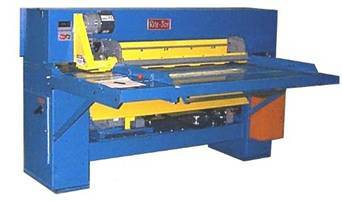 The maximum sheet across of the machine is 92” and the standard length through the machine is 200”, but this can be modiÿed to greater length if required. The machine is equipped with a touch screen for easy data entry, and the embedded PC running the Windows operating system allows for data storage as well as network and remote connectivity. Optional equipment include side trim capability, flexo printing of full 92” width, as well as sheet stackers and infeed lifts.